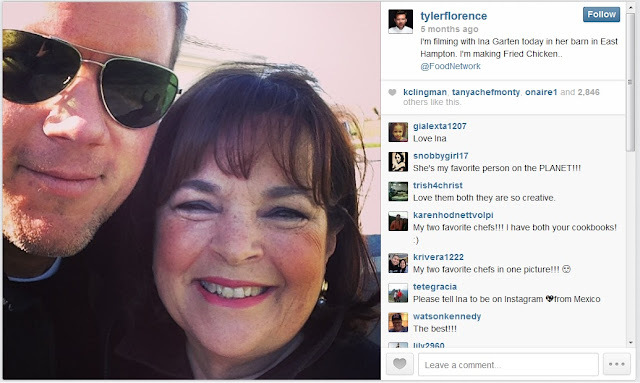 Did you see the new Barefoot Contessa episode with Tyler Florence? Baby rosebud and I loved it! It airs again on Monday, September 9th at noon if you missed it (see the details here). They started by making a birthday cake for Tyler's son. The chocolate cake was made with buttermilk and the batter looked amazing (Ina is a pro after all). She made a ganache frosting and stacked the cake up asymmetrically at Tyler's request. They decorated the whole thing with bright candies that really popped off the chocolate frosting. It was beautiful (and I might be heading to ABC Cake Decorating to finally buy some legit cake pans to make it for Baby Strawberry's FOURTH! birthday next week). Then they went to Ina's favorite place to buy chicken for Jeffery's dinner every Friday. My kids loved seeing the chickens and I love Tyler quipping about how proud he was to hear Ina's secrets. For lunch, he made Fried chicken and added whole fresh herbs and garlic to the oil to layer the flavors. The seasoned flour looked amazing. He added Sriracha to the buttermilk for even more flavor. I liked his tip to fry only a few pieces at a time to keep the temperature up. I don't fry things often but after I watched him make this recipe I was dying to make some chicken! You can see the recipe here. PS If you're on Pinterest... Barefoot Contessa is finally! It's kind of fun to follow her. If you're a dork like me. Don't tell my friend Kara I wrote this blog post. She'll die. Hopefully some of you like Ina like I do. And try the slaw. I'd never had Brussels sprouts before (seriously) and it was fun and yummy to try them. With a very sharp knife, cut the Brussels sprouts, kale, and radicchio across in thin shreds and put them all in a large bowl. In a small bowl or measuring cup, whisk together the lemon juice, olive oil, salt, and pepper. Pour enough dressing on the slaw to moisten it well. Add the cranberries. Shave the Parmesan in big shards with a vegetable peeler, add it to the salad and toss well. Check for seasonings and serve cold or at room temperature. Looks so pretty on the plate. I love to serve a rainbow. Can't wait to try this. Two of my favorites!! Love this slaw recipe. Saw your recent cookie post and then saw this one. I really like Ina (and Tyler), too. I saw that episode AND made that slaw when it was on, too. I loved it. Can't get my family to eat kale.